Update 12/06/2018: At Qualcomm’s Tech Summit in Hawaii, the slides for OnePlus’ presentation suggested that its next flagship smartphone will be the first to feature a Snapdragon 855 chipset. However, the slides were incorrect, as the CEO Pete Lau said the device would be “among the first,” resulting in confusion. A OnePlus spokesperson confirmed the error to Engadget, stating that it was due to the original writer not being native to the English language. When it launches next year, the next OnePlus smartphone will be the first Android handset to feature Qualcomm’s upcoming Snapdragon 855 chipset. OnePlus CEO and co-founder Pete Lau announced the news on Wednesday during the second day of Qualcomm Snapdragon Tech Summit in Maui, Hawaii. Lau didn’t provide an exact timeline for the launch, but if the next OnePlus smartphone is to be the first to launch with the 855, it’s likely to come in the next few months. 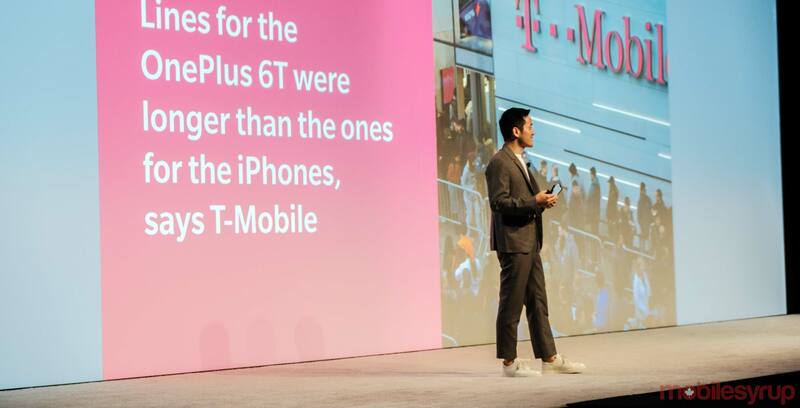 One thing to note here is that this upcoming device is almost certainly not the OnePlus 7 — the company has already said as much. The OnePlus 7 is likely to come later in the year. It too will feature the 855, but won’t include Qualcomm’s X50 modem, which is the component that enables 5G connectivity. Lau was later joined by EE CTO Fotis Karsonis. Together, the two announced that they’ll partner to launch the 5G-capable OnePlus smartphone.